For the calculation, see Johnson's SU-distribution. William Blake's hand painted print for his poem "The Shepherd" depicts the idyllic scene of a shepherd watching his flock with a shepherd's crook. This image represents copy B, printed and painted in 1789 and currently held by the Library of Congress. A shepherd's crook is a long and sturdy stick with a hook at one end used by a shepherd to manage and sometimes catch sheep. In addition, the crook may aid in defending against attack by predators. When traversing rough terrain, a crook is an aid to balance. 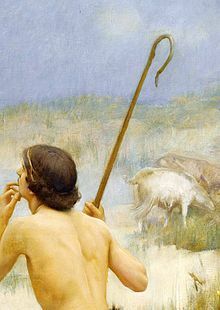 Shepherds may also use the long implement to part thick undergrowth (for example at the edge of a drovers' road) when searching for lost sheep or potential predators. The innovation of a hook facilitates the recovery of fallen animals by ensnaring them by neck or leg. For this reason the crook has been used as a religious symbol of care (particularly in difficult circumstances), including the Christian bishop's crosier. In medicine, the term shepherd’s crook is used to describe a right coronary artery that follows an unusually high and winding route. This variant, which has a prevalence of about 5%, imposes technical problems in angioplasty procedures. Thalia, Muse of comedy in Greek mythology, was usually seen holding a shepherd's crook. 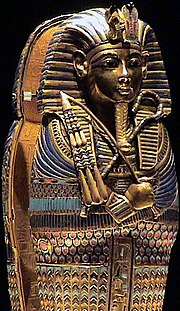 The shepherd's crook and the flail (an agricultural tool) are insignia of pharaonic authority: the Crook and flail. Wikimedia Commons has media related to Shepherd's crooks. ^ Shriki, Jabi E.; Shinbane, Jerold S.; Rashid, Mollie A.; Hindoyan, Antereas; Withey, James G.; DeFrance, Anthony; Cunningham, Mark; Oliveira, George R.; Warren, Bill H. (2012-03-01). "Identifying, Characterizing, and Classifying Congenital Anomalies of the Coronary Arteries". RadioGraphics. 32 (2): 453–468. doi:10.1148/rg.322115097. ISSN 0271-5333. PMID 22411942. ^ Gossman, David E.; Tuzcu, E. Murat; Simpfendorfer, Conrad; Beck, Gerald J. (1988-01-01). "Percutaneous transluminal angioplasty for shepherd's crook right coronary artery stenosis". Catheterization and Cardiovascular Diagnosis. 15 (3): 189–191. doi:10.1002/ccd.1810150313. ISSN 1097-0304. This page was last edited on 6 March 2019, at 07:37 (UTC).